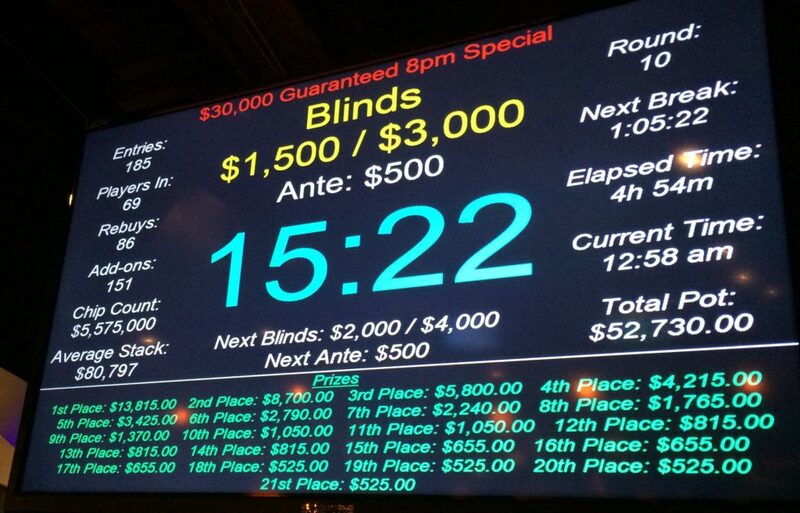 In case you didn’t see my announcement in this week’s #PNWPokerCalendar, I’m going to be live reporting from the World Series of Poker this summer, and the application process, plus starting to make preparations for the long haul of the series after getting accepted, has sucked up a lot of time. On top of that, if you liked the hand-by-hand examination of a 6-Max tournament I did, I spent a large part of the last week working up a similar series of articles for a PLO8 game, showing the chance of making the best high/low hands for the players remaining on each street. That will start going live in the next couple of days. But it hasn’t left a lot of time for the poker. I wasn’t able to get to the tournament until 9pm, so I bought the add-on, despite it still being No Re-buy/Add-on Week. I did well for the first three hours, then started slipping down after midnight. I made a raise with A♠Q♠ for about 25% of my stack on the last hand, then called all-in against a slightly larger stack who shoved AxKx from the blinds. I could have folded with 10BB behind, but I didn’t want to. Another shorter-stacked player went all-in on the same hand and was knocked out. Four hours. 68th of 185 entries. Lost a race after losing a bunch of chips in the first round of the button. Forty-five minutes. 21st of 21 entries. 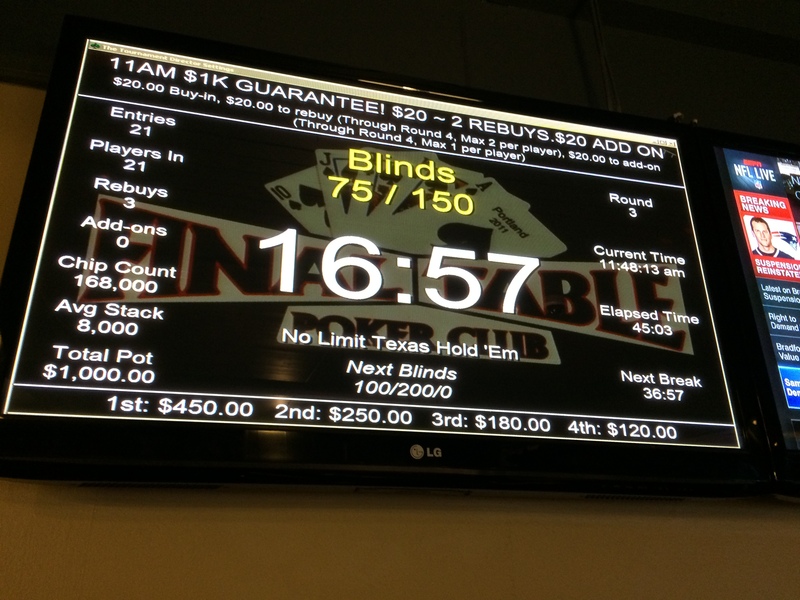 Got off work (not the WSOP job yet) and dropped into The Game for a little shootout. I need to work on following my instinct to cash out while the cashing’s good. 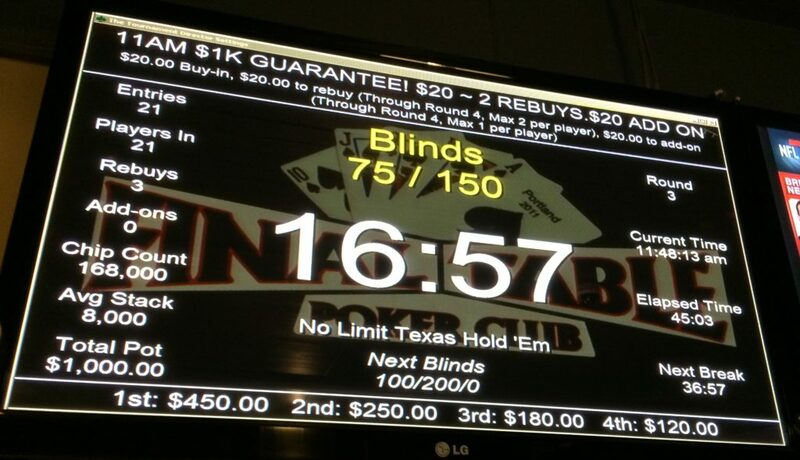 There was just one table with six players after midnight Wednesday, and after the first hour I was up 100BB. One of the players left the table and I was inclined to go home myself after a long day, but since there was just 40 minutes to closing, I decided to stay. 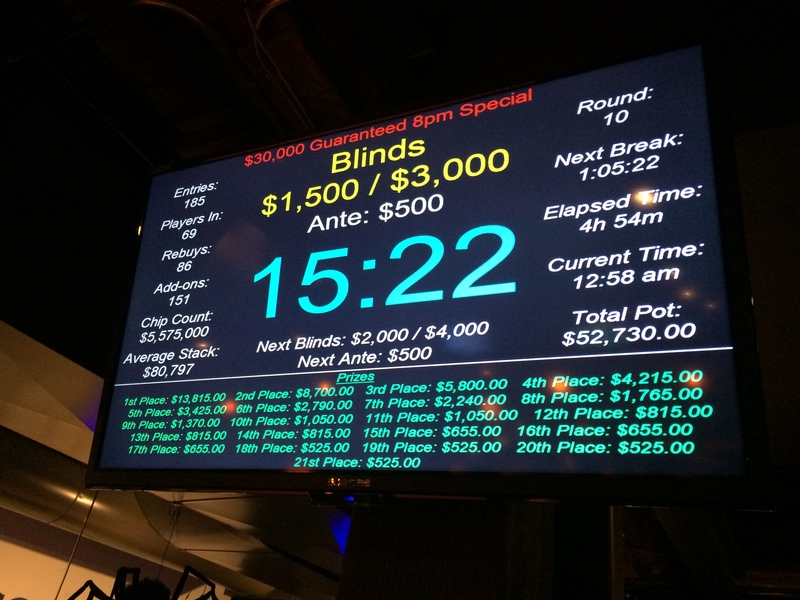 This entry was posted in General Poker, Live Games, Ring Games, Tournaments by Poker Mutant. Bookmark the permalink.